All the pieces offering provisional interpretations of the economy of mid-Saxon Surrey I have written and uploaded so far (for those coming direct from Google or WordPress, may I introduce you to this, this and this) have been based upon the sixth- to ninth-century coins recorded from within its bounds. The indications are strongly in favour of Surrey being party to the broader trends in trade and exchange practices and processes in modern-day eastern England, which is all well and good, but it got me thinking – how does its numismatic geography (that is, where the coins have been found as opposed to where they were minted – though I have something on that very subject waiting in the wings) compare to those for other artefacts dating from the same period? To avoid writing a comprehensive review of the material archaeology of the middle Anglo-Saxon centuries in Surrey, I thought it would suffice to limit this analysis to metal objects whose composition and/or execution might warrant the description “high status”, “elite”, or “prestige”. 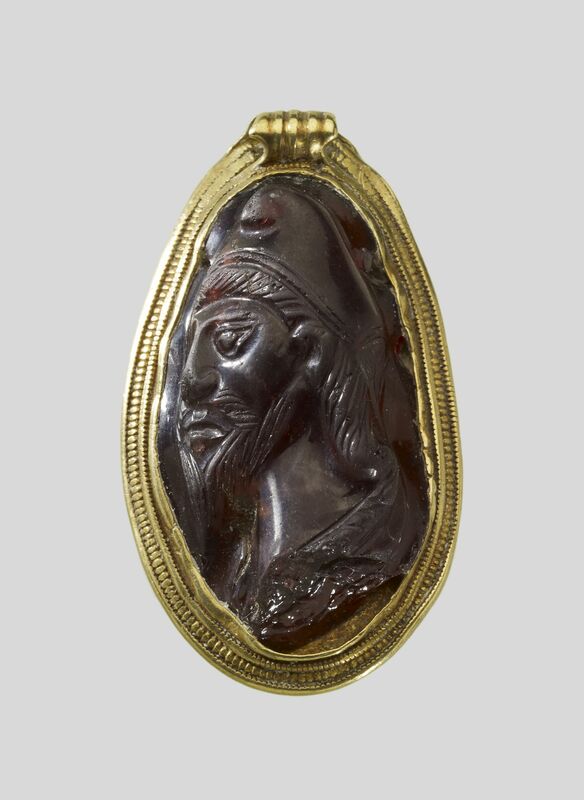 My starting point is Surrey’s only seventh-century artefact that can hold its own against the best metalwork of the period (and we’re talking about the likes of Sutton Hoo and the pick of the Staffordshire Hoard), a pendant of gold framing a Byzantine garnet cameo bearing the image of a man variously interpreted as a magus or bishop (HER 3822). As far as I’m aware, it is the only seventh-century gold object known from Surrey (though there is a slim chance that this could be number two), which arguably should confer some kind of importance on its provenance (cf. the small number of fragmentary gold artefacts from the Selsey area in Sussex noted and illustrated by Welch 1978, 29 & Plate 1.5-8). The problem is its find-spot is not certain, or else has been confused in the few published accounts of the artefact. Webster (1991) describes the pendant as “a stray find from redeposited soil” from Epsom, a rather vague statement which nevertheless sets alarm bells ringing. A more recent summary of the object (Archibald, Brown & Webster 1997, 233) achieves the rare feat of simultaneously explaining and exacerbating the ambiguity over its provenance by giving it as “Ewell, Epsom, Surrey, probably from the Anglo-Saxon cemetery” (while also shifting its dating forward slightly from Webster’s “mid 7th century” to “second half of 7th century”). Its online British Museum Collection entry likewise gives Ewell as the place of discovery, as well as repeating the information concerning the redeposited nature of the soil in which it was found, only this time attributes the metalwork (as opposed to the much earlier jewel it holds) to the late seventh century. I have it on good authority that the true find-spot of the pendant lies to the north of Ewell, in the Stoneleigh area (cf. Nail 1994). It was found in a garden in the 1930s, shortly after the area was developed for housing. The spanner in the works – and the origin of the qualification regarding redeposited soil – is that the topsoil of the gardens hereabouts was imported by rail, meaning the pendant could have come from anywhere within a wide swathe of Surrey (and maybe even further afield). Nonetheless, several factors can be cited in support of Ewell being the sort of enduringly/repeatedly-important place (akin to the “seminal places” Alan Everitt identified in Kent) where such an item might be purposely deposited. It is the site of a Roman roadside settlement, at least one Early Anglo-Saxon cemetery as well as a lone furnished burial including a sugar-loaf shield boss of later seventh-century date from a site known as Quelland. According to the PAS, the locality has yielded a considerable number of quotidian metal artefacts of the eighth to tenth centuries (listed in the appendix to my ‘Mercian markets…’ piece). Its early documentary appearances are in the run of problematic Chertsey charters, but Domesday Book reveals it to have been in royal ownership and points to it being relatively important in the eleventh century. On the other hand, throw the words “accidental” and “loss” into the mix when considering the pendant and such indicators might just as easily be of no significance whatsoever. I have the urge to do a bit more research into the object, so expect me to return to it at some point in the future. 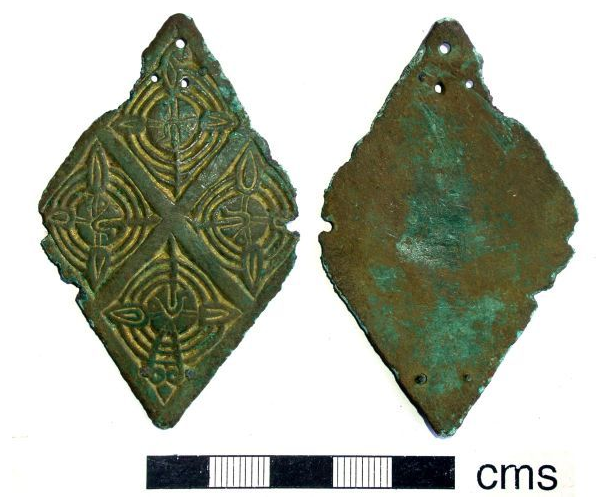 If the expert dating is to be believed, the Ewell pendant belongs to the period when “Surrey” (I use the speech-marks to emphasise that it may not have been coextensive with the historic county) was controlled by Kent, Mercia and Wessex in relatively quick succession. Attributing it to the politco-cultural influence of any one of those kingdoms is not easy given the period of time in which the item was made, though I think there are quite a number of examples of similar style and date from Kent (this may be a figment of my imagination so don’t quote me on it). 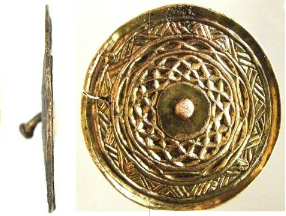 Part of the reason why hanging-bowls have attracted so much attention is because they constitute an unmistakable type of Celtic/Brittonic metalwork, most clearly seen in the designs of their enamelled escutcheons (e.g. Yorke 2010, 83). 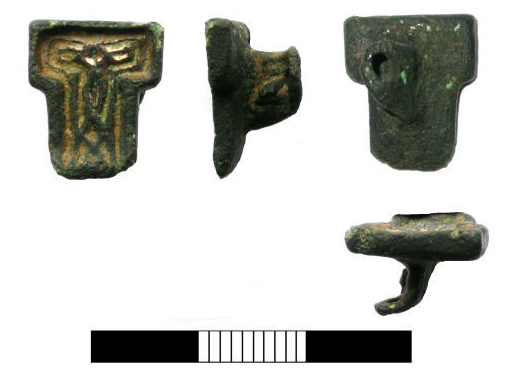 Aside from the complete example from Gally Hills, I count three hanging-bowl escutcheons from Surrey. Two are poorly-provenanced: one said to be from Morden and another came into the hands of a London antiques dealer care of a schoolboy from “Warplestone”, i.e. Worplesdon (Bruce-Mitford 2005, 125-27 and 104 respectively – the Morden escutcheon is in the care of the British Museum). To these can now be added a more securely-located (if fragmentary) example from the Leatherhead area, reported and recorded through the Portable Antiquities Scheme (PAS Unique ID SUR-4732D4). It is interesting that the escutcheons from Morden and Leatherhead were both found close to Stane Street, though Banstead Gally Hills (and Worplesdon, for what it’s worth) are set well clear of any known Roman road, and accidental loss seems possible in all cases other than the one from the barrow burial (cf. Bruce-Mitford 2005, 127, for note of an excavation confirming that a late-sixth/early-seventh century hanging-bowl escutcheon found at West Wickham just beyond the eastern boundary of Surrey was not associated with any other contemporary finds or features). If any judgement on the nature and provenances of the above material is to be offered at this stage, it is that there does seem to be a cluster of sites (Ewell, Banstead, Leatherhead) on the dip-slope and Downs of the section of Surrey between the Mole and Wandle. John Hines (2004) made a convincing case for the early Anglo-Saxon cemeteries and artefacts excavated at Croydon, Mitcham, Beddington and environs to represent the heartland of the “original” Sūþre-gē, but – bearing in mind the lack of certainty as to what Surrey comprised at any point prior to the Conquest/Domesday era – might we be starting to see evidence that by (or during) the seventh century there had been a westerly shift to a new focus around and beyond the headwaters of the Hogsmill river? It is abundantly clear from the coin evidence of the late-seventh and early-eighth centuries that precious-metal objects manufactured far, far away could enter Surrey. The same is true of non-numismatic objects and, what is more, the numbers decline in the same way as the broad-flan pennies relative to their “proto-penny” forebears, though the numbers of artefacts from the earlier decades are not known with a frequency comparable to the numismatics. The earliest of these is the head of a gilded disc-headed pin from Bletchingley, dated circa 720×800 (Geake 2006, 290-292) or 750×800 (SUR-34D906). A simpler, polyhedral pin-head of eighth or ninth-century date is known from Frensham (SUR-03B452), and is noted here because it is made of silver; the only other non-numismatic object of the same precious metal and period from the historic county area is a hooked fastener found in West Clandon parish (SUR-68A1E7). 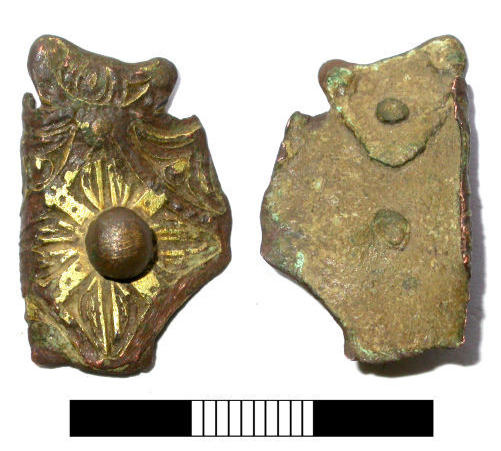 Larger and even more distinguished from an artistic perspective is a gilded copper alloy mount from “a woodland findspot” in the vicinity of the village of Albury (SUR-47F8A7). Dated to the four-decade period from 780-820, what excites me about this piece is the conjecture advanced in its PAS database description that its form “suggests use on a casket or perhaps book cover”, both most credibly associated with an ecclesiastical or ecclesiastically-linked institution. I have an inkling that the place-name and topographical situation of Albury may have some significance in this regard; I aim to explore this separately by means of an article I have started to write (and I finished it – you can read it here). The ninth century: Surrey find-spots, exotic origins? The remaining artefacts to be considered for this piece are a diverse quartet found at different locations scattered across the county, but may share a common trait in terms of why they ended up where they did. 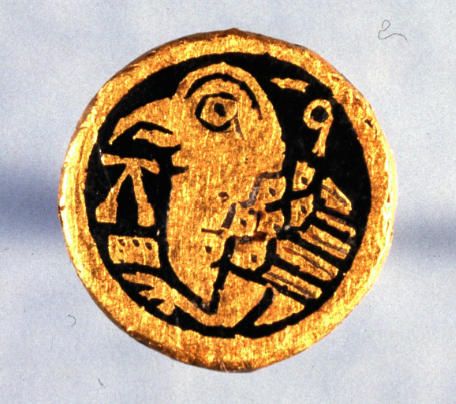 Let’s start with the fanciest and best studied of the bunch, the so-called Limpsfield Grange disc, a small gold object dated to the mid-ninth century bearing a design interpreted as an evangelical symbol that formed part of a larger object whose surface decoration was possibly on a Biblical theme (Okasha & Youngs 1996). The disc’s unquestionable Christian subject matter doesn’t mean it has to derive from a monastic/ecclesiastical context but, as with the Albury mount, on balance this would have to be the most obvious source of such an artefact (unless it came from a finger-ring, a possibility left open by its British Museum online catalogue entry). I have argued elsewhere that knowledge of the minster geography of Surrey in the ninth century is far from comprehensive, despite John Blair’s lengthy review of the topic in Early Medieval Surrey. As such, the fact that he found no evidence for any such institution in the south-eastern corner of the county may or may not be accurate, though Limpsfield gives few reasons to suspect it was once the site of a ninth-century minster. Might the Limpsfield Grange disc hence be an object entirely divorced from its original setting, not just from the larger object of which it was once part but also from the place(s) at which it performed its intended function(s)? The idea of a thoroughly ex situ “stray” object of non-local origin is one that can be posited for two other artefacts newly-reported to the PAS from places elsewhere on the Surrey Downs. One is a gilded mount, of uncertain purpose and assigned a rather conservative dating of circa 780×900, found in Reigate parish; the four-figure grid reference given in its PAS database entry places its provenance between Merstham and Chaldon (SUR-A845C6). 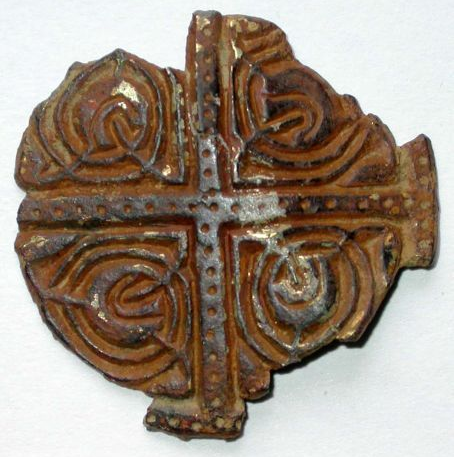 This object is important because it is of Carolingian style and potentially manufacture, a rare instance of an item with a continental connection post-dating the “proto-penny” era. The implication is that it too came to end up in West Surrey as a result of Viking activity, more specifically post-plunder long-distance transport and exchange – or loss. West Clandon parish is a particularly “productive place” in Surrey terms for mid-Anglo-Saxon artefacts, particularly foreign-minted coins, something which may not be unrelated to nearby Guildford’s later emergence as a town; I would posit that its proximity to Guildford at least serves to show how it was possible for “exotic” objects to enter the hinterland of the town. Excitingly, it is not the only eighth-century mount of Irish origin (or at least style) found in Surrey and brought to wider notice through the PAS. Though different in appearance and function to the West Clandon artefact, a fine gilded copper alloy circular mount has been reported from Wandsworth beside the Thames (LON-F3F921). It has been positively identified as deriving from a house-shaped shrine (a complete example would look a little something like this). Kevin Leahy’s account of the Wandsworth mount echoes Youngs’ discussion of its West Clandon counterpart in noting how “Irish metal work of this date is likely to have come into this country under the aegis of the Vikings” and this is supported by the recovery of a coin hoard from the Thames at Wandsworth deposited circa 873. More generally, there is plentiful annalistic testimony for the presence of Viking interlopers in Surrey during the second half of the seventh century, culminating in a confrontation at Farnham in 893. That they brought with them and more importantly left behind precious metal artefacts is demonstrated by the Croydon hoard of silver coins, ingots and hack silver, dated to circa 872 in a superlative 1986 essay by two leading scholars (reprinted as Brooks & Graham-Campbell 2000). Whether all four of the above artefacts owe their presence in Surrey to being “imported” by Viking interlopers cannot be proven, but surely forms the most credible explanation in the majority of instances. To look across the group of artefacts assessed in the paragraphs above, they come from 13 parishes, of which only five are the provenance of seventh to ninth-century coins or other artefacts: Bletchingley, Croydon, Ewell, Wandsworth and West Clandon. 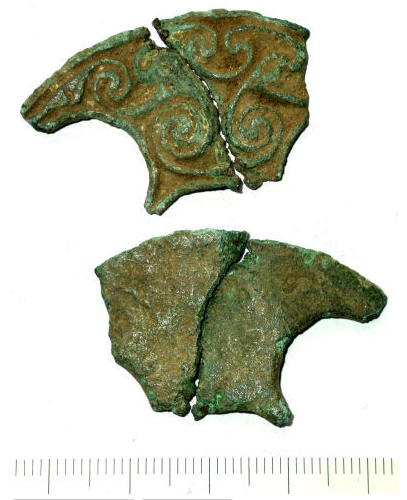 The correlation between the two types of artefacts is not strong, even less so when contemporary numismatics and non-numismatics are compared against one another. The non-numismatic artefacts divide into three groups: high-status items that relate to political elites of the seventh and very early eighth centuries, slightly more quotidian metalwork of eighth-century date, and objects (or rather pieces of larger objects) that are likely to owe their presence in Surrey to booty-carrying Viking raiders of the later ninth century. The third group is in many ways the most interesting, but the extraordinary circumstances by which the artefacts in question entered the historic county area means that they are of little if any use when it comes to shedding light on the topography of wealth in mid-Anglo-Saxon Surrey. The paucity of artefacts in the two other groups, meanwhile, supports (unfortunately) the idea that Surrey was not a key arena for royal and other elite activity and the consumption of prestige goods associated with such a status, especially in the eighth century. The small number of earlier finds may attest to strategies of conspicuous displays of material affluence in life and in death by those who exercised political authority within Surrey at a time when ultimate royal control oscillated between three kingdoms (this suggestion is influenced by the interpretation of a cluster of seventh and eighth-century barrow burials on the chalk downs of north Wiltshire put forward in Semple 2003). I would argue that the current, patchy picture we can derive from the artefactual evidence known from Surrey will be modified for the better as new finds are reported in coming years – there has certainly been a spate of them disseminated via PAS in the past couple of years – but it is highly unlikely that this will go so far as to contradict the picture already synthesised from the written records of the period. In particular, I expect a greater coincidence to emerge between find-spots and high(er)-status centres known or otherwise inferable through the documentary record, or, to approach it another way, that the character of certain artefacts might lead to the identification of previously unknown ecclesiastical and/or secular centres. On a similar tip, the recovery of further objects of foreign origin from within historic Surrey might allow for a more tangible view of when and especially where Viking raiders were present, augmenting the limited and often ambiguous historical testimony. In much the same way as the numismatics, the present corpus of non-numismatic material is large enough to provide hints and suggestions of patterns and trends, yet remains far too small for conclusions to be drawn with any real certainty. A few years hence, however, and with luck we will be considerably closer to having the data necessary to construct a much more refined and informed picture than is able to be painted at present. Thanks to Jeremy Harte at Bourne Hall Museum for detailed information on the Ewell pendant and the British Museum Image Service for the photos of the pendant and the Limpsfield Grange disc.